These Mustard and Gruyere batons are super easy. 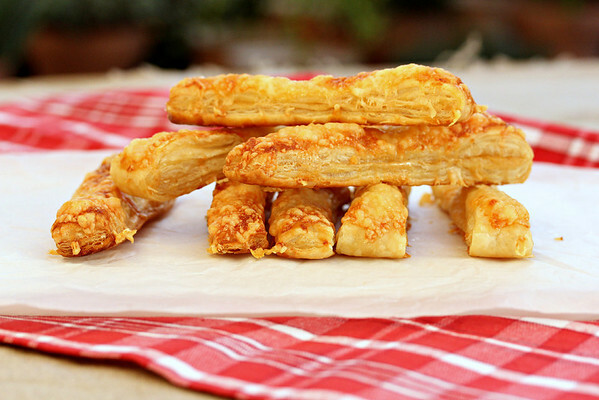 They are made from frozen puff pastry, and can be assembled and refrigerated a day in advance. Trust me, they are delicious, and very elegant. Makes 10 to 12 batons. Adapted from Ina Garten's Foolproof, which was inspired by Dorie Greenspan's Around my French Table. With a floured rolling pin, roll the unfolded puff pastry sheet out onto a floured board to 11 x 13 inches. Brush half of the sheet with the mustard, brush the edges with the egg wash, and fold the top over and press the edges together. Chill in a sheet pan for 15 minutes in the refrigerator. Move the pastry back to the board, and cut the pastry into 1 inch by 6 inch strips with a sharp knife or pizza wheel. Place the batons on a parchment lined baking sheet making sure they are not touching. Brush the egg wash and sprinkle with the Gruyere and Parmesan. Sprinkle with sea salt. Cover with plastic wrap and chill in the refrigerator overnight. Preheat the oven to 400 degrees F and bake the batons for about 18 minutes. Serve warm (they can be reheated). I have made these! (I have all of Ina's books. :)) They were so easy and fun to make, and a hit with everyone. I have all of Ina's books too! Love them all. Thanks Marie! I own everyone of her books. I've made Dorie's recipe...and now I must try Ina's! Beautiful! I'm going to have to check out Dorie's version. Thanks! They look so yummy.... A good glass of wine would be great served with your gruyere batons! OMG! 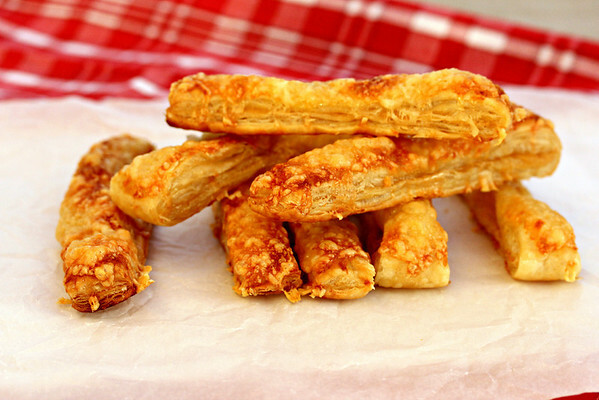 These are the perfect football watching snack. Love them. Thanks Laura. They were a big hit in our house. Chipotle powder is one of my favorites, but would love to check out beet root and carrot powder from savorx!